It was the last day of Paro Tshechu and my team was celebrating our four days of success, having delivered our mission of providing clean toilets to thousands of people and literally putting an end to open defecation in the place of worship. We were paid a surprise visit by His excellency the Prime Minister and the honourable chairperson of National Council among others. They didn't go to VIP toilet but our public toilets were kept so well that we could impress all our esteem guest and our Prime Minster. Thank god His Excellency visit before we faced the water problem. There was about an hour of water shortage and within that short time our toilets were overwhelmed by problems. When I heard the arrival of His Majesty to the Tshechu ground I was anxiously running after people to get the problem fixed. I was sweating and panting. I bothered every official I knew in the area and finally we caught hold of the plumber, Ap Jochu, the only person who knew how to fix it. I nearly kissed him. By the time I caught my breath back I was told His Majesty was leaving. I didn't even get a decent chance to look at my king. From the extreme corner we were located at I saw waves of people struggling to get closer view of His Majesty as he left. I could have joined the crowd and pushed myself forward to get a glimpse too but we were running low of Toilet Paper supply. So I had to run to a shop nearby to purchase toilet paper rolls. On the way, from above the wall I saw His Majesty briefly on the last turn on the road down to the valley. I reached the other toilet to check if they needed toilet paper. Just then I got a call. It was Dasho Zimpon. He told me that I was summoned by His Majesty. I couldn't believe this was happening. I ran to the location Dasho called me to and down the valley we followed the entourage. I was flying in the air. We got ahead of the royal entourage and Dasho made me wait on the bridge. I was the only person kept on the bridge and the next person I would see was His Majesty. I could see thousands of people on both ends of the bridge waiting to get a glimpse of His Majesty. I was frozen, I didn't move an inch even though no one was watching. Then came the moment, I couldn't look up directly but I could make out from the radiance that His Majesty had come. I bowed down to pay my respect and froze back to stillness. 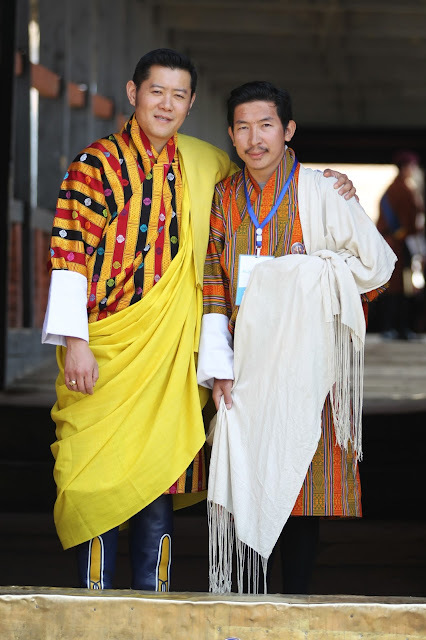 His Majesty congratulated me on my teams' work during the Tshechu and told me to walk alongside him across the bridge. I had crossed that bridge thousand times in my life but even in my most beautiful dream I haven't seen myself walking with His Majesty the King and talking about the work I am so passionate about. I could share Bhutan Toilet Org's Roadmap and the challenges faced in maintaining public toilets. His Majesty talked about the importance of behavioural change in making our efforts sustainable. And at the other end of the bridge His Majesty spent some more time blessing my dream with his guidance and assurance of royal support henceforth. Everything seemed so possible suddenly and I couldn't wait to tell my team. To make this priceless moment live with me forever His Majesty granted a Kupar with me with the permission to share it here. I shall look at this photograph and stay motivated for the rest of my life. And this picture shall remind me each day that I can't take rest on my dream anymore. For making this priceless moment possible I would like to thank His Excellency the Prime Minister, my toilet team, my volunteers across the country and all those people who believed in me and supported Bhutan Toilet Org. Wow! Wow! Congratulations to you man. I share your joy and excitement for meeting your most respected King. The photograph is so beautiful and great! Your handsome King is also very well respected by people around the world as well, for all his visions and kindness. You fate is always good to be able to meet him because you have a good and sincere heart. Congratulations again with warmest greetings from your friend in Malaysia. As i read your post i am equally excited like you.Tashi Delek Passu Sir. Your toilet before temple principle answered... Keep moving la..
.....and u are our inspiration. The God himself came to bless you. Trashi delek. Sky is the limit now. Aaawooo , i am so happy for you. My heart was already racing with happiness while reading this happy post. I wish for a kupar with our godlike king, the most handsomest with the most beautiful heart ever in the whole world. Thanks for your post, sir. It's really inpsiring one and it did inspire me, too. Our every young youth should see this post. Your post taught me a lesson that if we do good things that benefit other people we will never be left unrecognised. It just makes me more responsible citizen as a Bhutanese. Tashi Delek! Proud of you... Brother. Keep up. Congratulations.... I was equally happy and getting overwhelmed as i read your piece. Congratulations Mr Passng; you deserve this rare occasion of His Majesty's blessings simply because your mission is truly for the social cause. U r a real hero, Passu Sir. U have become the luckiest of us all to have got the opportunity to walk with His Majesty the King and get to have a photograph with him..... that's really a priceless moment. Keep up the good work as always. Congratulations Passu sir and the team! Truly inspiring and exemplary! Keep it up la. Congratulations Passu..Indeed u are blessed for your hard work and effort..keep inspiring others!!! Knew this moment was coming, Passu. Can't be happier for you and your team. I belive in you always and I always enjoy reading your articles. While reading this article I equally feels your challenges and excitement and of course the blessing motivation from our beloved His Majesty the King. Keep up and congratulations la. Congrats for ur good initiative la..
Appreciations. I hope you keep this going. We need more people like you. Tashi Delek... I am proud of you Passu. Success guaranteed by the inspiration of HM...please I look forward to read more success stories. You have always been an inspiration for thousands of Bhutanese people including me. You very well deserve the priceless moment with our His Majesty the king and I am really happy for you and i am sure,this is just the icing on the cake of your relentless and unshakeable desire to do something good for the society. Cheers. WOW...that's awesome sir! your hard work is never in vain. Keeping going sir and I am eager to talk more about it once I am back to Bhutan. Can't wait. Tashi Delek !!!! Congratulations !!! PaSsu, you are not only the champion of Bhutanese bloggers, but the hugest inspiration to us all as a social activist. The movement you have effected behavioral change in toilet use among Bhutanese is simply amazing. Congrats once more for this wonderful moment with our King and Prime Minister! Out of the thousands that came to seek blessings, you were the one who truly got blessed. Congratulations on the success and best wishes. The post of yours gave me a different feeling and i really appreciate your effort sir. Looking forward working with you la.